The Michigan Panthers ownership reflects the dedication of three businessmen and sportsmen whose business and professional careers have all prospered in the state of Michigan. 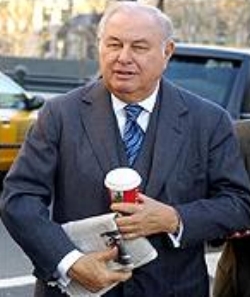 A. Alfred Taubman, one of the nation's leading real estate developers, heads the ownership group as chairman of the board. He is joined by Judge Peter B. Spivak, team president, and Max M. Fisher. Mr. Taubman is chairman and chief executive officer of The Taubman Company, Inc., which he founded in 1950. The firm, headquartered in the Detroit suburb of Troy, is one of the foremost owner-builder-developers of regional shopping centers in urban and suburban locations throughout the United States. A native of metropolitan Detroit, Taubman was trained in architecture and educated at the University of Michigan and Lawrence Institute of Technology in Southfield, MI. He is a frequent spokesman for the real estate industry on matters regarding urban planning, central city revitalization, public policy and retail development. In addition to activities with his own firm, Taubman also participates in a wide range of business, civic and cultural endeavors. Born in Philadelphia, Judge Spivak has been a Detroit area resident since the age of 14. He graduated from Ohio Wesleyan University and earned his law degree from Northwestern University. He is a member of the State Bar of Michigan and its sections on domestic law and arts, sports and entertainment law. He has been a member of the board of trustees of New Detroit, Inc., the city's urban coalition, from 1971 to the present. Judge Spivak is of counsel to the law firm of Jaffe, Snider, Kaitt & Heuer in Detroit. He served as a judge on the Third Judicial Circuit of Michigan from 1974 until 1981. He was chairman of the Michigan Public Service Commission from 1964 through 1968, and later was judge and presiding judge of the Wayne County Common Pleas Court. Mr. Fisher was born in Pittsburgh, PA, and raised in Salem, OH. He is a graduate of Ohio State University where he was a member of the football team. He serves on the boards of several major corporations and participates in many philanthropic and community efforts. Mr. Fisher is the founding chairman of Detroit Renaissance, Inc., the business leadership group which is devoted to the physical and economic revitalization of the City of Detroit. Mr. Taubman joins Mr. Fisher and other prominent area business leaders on the Detroit Renaissance board. Taubman's Panthers won the 1983 USFL Championship, but lost a reported $ 6 million doing so. The USFL's plans to move to the fall for 1986 in effect killed the team, with the Panthers merging with the Oakland Invaders for the 1985 season, Taubman being listed as the combined team's majority owner. In 1982 he purchased A&W Restaurants (later sold) and during 1983 Taubman purchased the famed auction house Sotheby's, taking the firm public in 1998. Sotheby's proved his downfall in a sense, as in February 2000 he was forced to step down from Sotheby's chair after the FBI charged him with collusion and price-fixing. In December 2001 Taubman was convicted of conspiracy, and sentenced to 366 days in prison. His family divested his controlling interest in Sotheby's during 2005. Despite his conviction and imprisonment, Taubman maintained his innocence and remained active in business and philanthropic circles in the Detroit area.